Amanda Mundt two years ago, working at a school in Les Cayes, Haiti. The automobile accident could have happened to anyone, anywhere, with the same ensuing sense of deep pain and tragic loss. But this particular happened to people who had the sympathetic imagination and moral commitment to see and help those in need not just in their New England backyard, but in Haiti. And when their minibus and a truck collided in southern Haiti last Wednesday, three of those volunteers lost their lives, as did their Haitian driver. Three, either directly or indirectly, had Worcester connections. 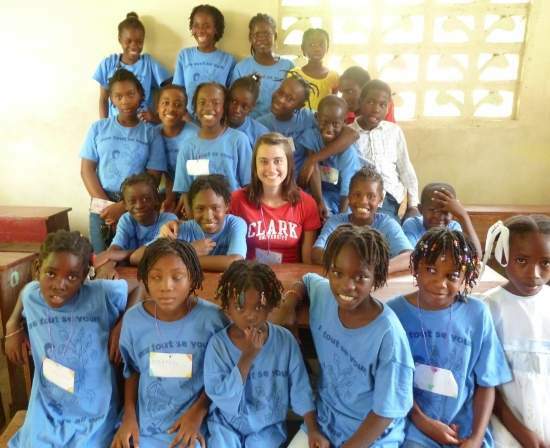 Amanda Mundt, 22, was a student at Clark; the minibus was returning from a Haitian school where she had established a summer program in 2011. Her aunt, Dianna Mundt, also died in the crash. Meagan Bell was the adult daughter of David Bell, the interim director of Clark’s International Development Program. Her father was seriously injured in the accident, as was Amanda Mundt’s father, Kenneth, who was flown to a Florida hospital. While fatal car accidents seem to happen almost daily in central Massachusetts, this does underscore the risks people take when they choose to put not only their money, but their bodies, where their mouths are. For those of us who believe that all lives matter equally, such news creates a profound conflict in our souls – or, at least in mine. Even though I didn’t know them, the painful truth is that this particular news invokes a particular grief. As a Worcester Telegram editorial states, “It hurts extra hard when people die or suffer while striving to be of service, whether locally or on the international stage.” This is particularly true for the young, whom one could easily imagine making the world a better place for so many years to come – and for whom you wish every joy life has to offer. But even as the loss and suffering of all weighs on my heart, I have to admit their example was a relief from another bleak week of news, in which I was reminded again and again of the brutal indifference and outright evil lurking in our culture. It’s harder to wallow in despair and discouragement when reading of people who make serving others such a central part of their lives. The Telegram editorial quotes Brian Concannon, director of the Boston-based Institute for Justice and Democracy in Haiti, who said of Amanda: “She’s just an extraordinary person. It was kind of amazing for someone her age to care so deeply.” Hopefully the examples of those lost or injured will, in the long run, inspire us to make that kind of commitment less unusual, both for individual volunteers and for our government. Meanwhile, my prayers are with the family and friends who knew Amanda, Meagan, Dianne, and that unnamed Haitian driver, survivors grappling with the void left by the absence of special individuals.